I read the following quote yesterday from a memorial service. The person he is talking about really isn’t the important issue so I won’t share the link. But why would a pastor say something like that? That is just ear tickling to try and relieve the grief of the family and friends. But worst of all it is a lie. Remember the post just from Sunday? This is a short list of people judged for one act. There are many more in the Bible. 24 And Joshua and all Israel with him took Achan the son of Zerah, and the silver and the cloak and the bar of gold, and his sons and daughters and his oxen and donkeys and sheep and his tent and all that he had. And they brought them up to the Valley of Achor. 25 And Joshua said, “Why did you bring trouble on us? The Lord brings trouble on you today.” And all Israel stoned him with stones. They burned them with fire and stoned them with stones. I must admit this wasn’t something that I was particularly interested in beyond the general interest I have in all of God’s Word. But the Lord desired me to really study His Word concerning the Law. I have had several people email me asking questions about it. I also got a comment on a previous post about the OT dietary laws. Beyond that I had been noticing more and more over the last few years an increase in the interest of believers following the OT dietary laws, feast and other regulations. I’m not talking about Jews who have become believers but Gentile believers whom are turning to follow the Law. It was clear to me in the NT that believers are not bound by the Law and are even warned to not return to the Law. However, when I ran across this teaching essentially I ignored it as a wrong teaching and something to pity those who fell into it. But the Lord has convicted me that this isn’t just some wrong teaching but is a false Gospel. We are not talking about the differences between denominations but the differences between being a Christian and a Mormon or Jehovah’s Witness. There is so much of the NT that deals with this return to the Law. The whole books of Galatians and Hebrews are full of warning about returning to the Law. All through the NT you can find references to the Law, Covenants and returning to the OT Law. Paul warns the Galatians of this False Gospel with dire warnings of having “fallen from Grace” or being “under a curse”. That is downright serious and thus I’m convicted by the Lord that I should not have let that slide without confronting it. Also as Terry and I discussed those who are teaching this return to the Law also tend to focus on what name they use to refer to Jesus and God. I don’t know if that is consistent or not just something we’ve noticed. Many of the differences in interpretation are furthermore blamed upon the differences in Bible translations with of course the KJV being the preferred translation. I don’t know what significance those features all have with each other though. So let us examine the Scriptures and see what they say about the Law and specific portions of it such as Dietary Laws, Circumcision, Sabbath observance, etc. Because this subject can get so convoluted with different topics and verses I’m going to try to stick with one idea at a time. Sunday night the pastor was talking about the fact that preachers need to preach the full gospel and not a water downed “Koolaid” version. That sent my mind to whirling. So below is what I scribbled down during church. We had to explain to the children what is meant by “Koolaid” because they are too young to know. For others who are too young to know where the phrase “Don’t drink the Koolaid!” came from, it is from Jim Jones who started the Jonestown Community in Guyana by the Peoples Temple, a cult. One time it was not a test but the real thing. Many churches today and many pastors have busily been turning the teaching of the blood of Jesus Christ into watered-down, weak Koolaid. No longer is there anything lasting offered just a initial sweet taste. The blue ones were added due to the suggestion of others. You are welcome to add more. Dan Brown is the author of the Da Vinci Code that was so popular a few years ago. His newest book is called The Lost Symbol. With the Da Vinci Code Dan Brown misrepresented the Bible and Jesus throughout his book. While claiming the Da Vinci Code is fiction, the down right lies about Jesus have been accepted as fact by many who would rather believe a fictitious story than the Bible. Now Dan Brown’s newest book is due out. The fictional book The Lost Symbol is based in Washington, D.C. and involves the search for a masonic pyramid and a hidden code. While in the Da Vinci Code Catholics and Jesus are portrayed in a negative light, the newest book portrays Freemasonry in a more positive light. Anything that encourages Freemasonry is dangerous. Many people may not even be familiar with Freemasonry (Masons, Masonic Lodges, Masonic Temples, etc.) but it is deeply ingrained here in the southern US. The Order of the Eastern Star is the women’s portion of Freemasonry. There are Freemasons that are upstanding members in many of the local churches and there are also pastors of churches that are members. This is something I grew up knowing about and never did really understand. I had an uncle who was a deacon of a SBC church and yet he was a Freemason. He would not discuss it. He also had a Freemason Funeral upon his death. So I have seen the Freemasons bizarre practices in person. Brown goes out of his way in “The Lost Symbol” to present the lodge as essentially benign and misunderstood. Masons are praised for their religious tolerance and their elaborate rituals are seen as no more unusual than those of formal religions. The plot centers in part on an “unfair” anti-Masonic video that “conspiracy theorists would feed on … like sharks,” Langdon says. Ex Masons For Jesus is a website that is dedicated to revealing the false teachings of Freemasons. Here is some information from their site. How can you quickly know that the foundational teachings of Freemasonry are false? Notice these statements from Masons in the following articles. “The secret handshakes certainly do still exist, but we don’t roll up one trouser leg any longer. In the old days it was seen as a symbol of humility not for anything else,” Levenston said. I posted several times about The Shack over a year ago. Since then I would have thought that The Shack would have become less popular but it still remains one of the most read books, even by Christians. There are so many problems with The Shack and people continue to read it and base their beliefs about God and Jesus on it. This is an interesting compilation of several problems with The Shack. Be prepared to explain to others why The Shack is not suitable reading when compared to The Bible and it’s truth. 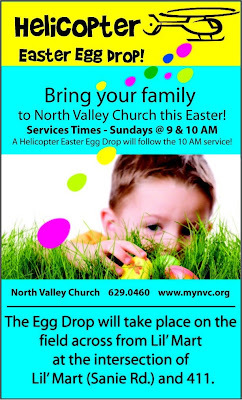 Did you catch Easter Eggs dropped from a Helicopter this past Easter? Or did you focus on the Savior who came from Heaven and died a cruel death so that you might have eternal life? Oh, I’m sure the preaching did cover Christ’s death, burial and Resurrection. But surely that was overshadowed by the helicopter dropping eggs. Just ask the children in a few weeks and see which they remember better. When we come to Bible interpretation we see where the world view we bring to the Bible reading affects everything we read. Do we trust the Lord to protect His Word and give us His Truth or do we look for the things that we think are contradictions? This is dependent on our world view and our view of God Himself. Do you believe that God created the world and everything in it or do you believe the latest scientific “findings”? Do you trust God to preserve His Word as He says He will? Or do you believe man has totally corrupted God’s Word and there is no way to know what God has really said? Do you not know that the Lord is in control of everything, nothing happens that He does not allow? Do you think that the Lord has so little control over His Word that He has let man totally corrupt His Word? Does God not direct every step of man? Or do you think a simple man can thwart God’s purposes? You see what I mean about a man’s world view affecting his every thought about Scripture. Who is in control? God or man? Al Mohler wrote about a discussion on the validity of the Bible in his post Fighting Words about the Bible? . …Where we have difficulty understanding how one gospel relates to another we face a basic question — one tied to the presuppositions we bring to our reading of the Bible. We will see the problem as lying either in our inability to understand the Bible or in the Bible’s inability to offer a consistent and consistently truthful message…. So examine your presuppositions and see if you trust your own wisdom more than God’s. There is nothing wrong with admitting that you do not understand everything in the Scriptures. No man knows all there is to know about the Bible. But that does not make a flaw in the Scriptures. The flaw is always man’s because we are depraved and evil in our hearts. (see Genesis 6:5) Nor does any man understand every possible concept in the Bible. Even the angels don’t know all there is to know, they desire to look into the gospel and salvation of man. Why do so many people argue that the Bible is corrupted by man? What purpose does it serve to argue about verses and imply that Scripture contradicts Scripture and that we can’t possibly know what the Lord said? If you cannot trust God’s Word then your belief in Christ is flawed at best. When you start ruling out God’s Word as unbelievable there is no stopping. Then you soon get to the position that God didn’t create the earth in six days. That marriage does not have to be between a man and a woman. That women are allowed to be preachers. The list can go on…. Once you step on the slippery slope of you choosing what is true and what isn’t, you’ve created your own religion. Instead of following God’s Word you are following your own words. You can’t trust the Bible…. The Bible is full of contradictions…. We don’t have all the books of the Bible…. You will find they have been reading many of the books that have been written lately to disprove or at least question the Bible. Books such as The DaVinci Code and the writings of The Jesus Seminarhave both encouraged the belief that we have a flawed Bible that cannot be trusted. If anyone starts up with “Well, the Council of Nicea did …” when arguing that Bible is flawed, you can probably count on them having gotten their information from one of these false teachings that are written to contradict the Bible. This verse seems to be explained very well by the following little story. As I grew up, I never questioned his place in my family. In my young mind,he had a special niche. My parents were complementary instructors: Mom taught me good from evil, and Dad taught me to obey. But the stranger…he was our storyteller. He would keep us spellbound for hours on end with Adventures, mysteries and comedies. Dad ruled our household with certain moral convictions, but the stranger never felt obligated to honor them. Profanity,for example, was not allowed in our home… Not from us, our friends or any visitors. Our longtime visitor, however, got away with four-letter words that burned my ears and made my dad squirm and my mother blush. My Dad didn’t permit the liberal use of alcohol. But the stranger encouraged us to try it on a regular basis. He made cigarettes look cool, cigars manly and pipes distinguished. This is how people like Oprah Winfrey and Dr. Phil share their false teaching with weak, willing, gullible, and silly women. 6 For among them are those who worm their way into homes and captivate silly and weak-natured and spiritually dwarfed women, loaded down with [the burden of their] sins [and easily] swayed and led away by various evil desires and seductive impulses.